More than a few years ago, I remember a friend saying he was troubled by the “sexual politics” of Pixar’s celebrated 2009 film Up. At the time, I thought his analysis was a bit much—his parents were professors, and he really couldn’t help talking that way. However, he did have a point. The heartbreaking intro to the film—perhaps the single biggest emotional punch to the gut in an animated film since Bambi’s mom died—depicts a man living his life with his wife, who gives up her own aspirations for the quotidian course of marriage and homeownership. At the end of a painful five minutes, she passes away, her dream of motherhood thwarted and her yearning for other adventures similarly unfulfilled. And then the old man gets to have his own wonderfully wacky adventure. How fair is that? 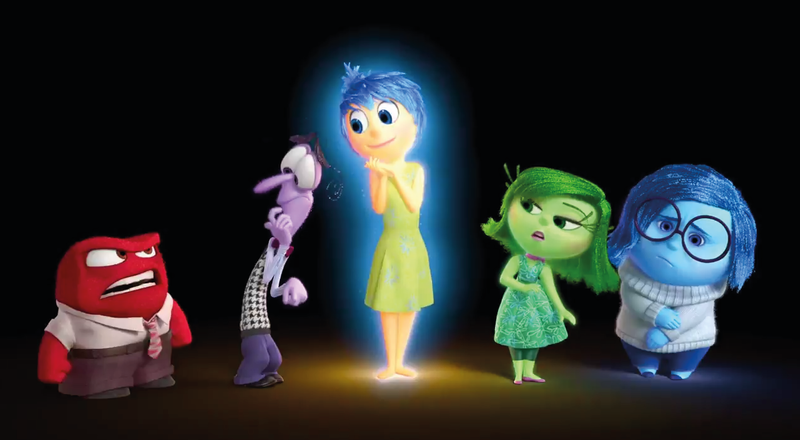 There is probably a lot to be said about gender and sexuality in Pixar films—certainly most have focused on male protagonists, with the notable exception of Brave—but I’m particularly interested in the new Inside Out. At the outset, I should say that I love this film with a passion. I liked it so much I used the privilege of my Summer off from teaching to go watch it a second time one afternoon all by myself. (I hope Scott Walker isn’t reading this.) The film is utterly restless in its ingenuity and creativity and merciless in exploring the awkwardness both of growing up and doing your best to care for a confused, hurting child. To me, it’s in the Pixar pantheon right up there with Toy Story and WALL-E.
Having said all that, Inside Out plays with gender in a lot of ways—some hilarious, others a bit reductive and discomfiting. The movie follows Riley, the 11-year-old daughter of a loving, affluent family from Minnesota. Her happy world of friends and hockey is obliterated when her dad drags the family to San Francisco for a job at a tech start-up hilariously called Brang (“What did you brang?”). In Riley’s mind, the characters of Joy, Sadness, Anger, Disgust, and Fear handle the controls of her consciousness. The film’s portrayal of the workings of the mind is thrillingly original, with whole territories dedicated to long-term memory, abstract thought, imagination, and so forth, each with its distinct aesthetic and landscape. But the key thing is that the five emotions run the show at “headquarters”—the c-suite of the vast bureaucracy that is Riley’s mind. Joy, played by Amy Poehler, is a Leslie Knope-esque bundle of optimism and can-do spirit. Sadness is brilliantly played by The Office’s Phyllis Smith, a mopey girl in a turtleneck and glasses. These are the two key players, but the other emotions fill out certain gendered roles: Anger is a (literally) volcanic, stout little figure, who one critic described as looking like “a comic book newspaper editor” (hello, Perry White, J. Jonah Jameson). Disgust is a snarky fashionista, voiced by Mindy Kaling, always ready with a withering comment. And Fear is a squirrelly, nerdy dude, the sort of white-collar cube-mate who would freak out about changes to the company’s recycling policy. In Riley’s mind, these are the players. But the film takes us into other character’s minds as well, and this is where it gets interesting. In probably the most notable scene, angsty Riley is sitting at dinner in her new, unfurnished San Francisco home. She’s just had a terrible first day at school. Her mom probes a bit to see how things are going, and she immediately senses trouble. In her mind, all the same characters as exist in Riley’s are there, but they all have a mop of brown, mom hair, and they sit at a table that resembles nothing so much as The View. They are sedate commentators on the goings-on; though they possess the same range of inclinations (Anger seems to be an angry black woman), Sadness appears to be in charge. She’s the one running the show in Riley’s mom’s mind. It was a great comic gag, playing up gender differences between parents and opening up the premise of multiple emotions in one mind to additional characters other than Riley. (We see this later during the credits, with Riley’s teacher, the cool girl at school, a birthday party clown, and even dogs and cats.) But it does speak to a very gendered way of thinking about the mind and psychology. Why is Sadness in control of the mom’s brain, and Anger in control of the dad’s? Why is the mom’s mind a table of more or less equals, while the dad’s is imagined as the command center of a battleship? And even in Riley’s mind, why are Joy, Sadness, and Disgust female, while Anger and Fear are male? In some other male characters’ minds, they’re all variations on the stout Anger character. There is a hilarious scene where Riley bumps into a prepubescent possible boyfriend, in whose mind the sirens are blaring and he’s at a loss: “GIRL! GIRL! GIRL! GIRL!” It’s a funny moment that anyone who’s been a teenage boy (or girl, for that matter) can probably relate with. But it’s still part of a bigger scheme in which our emotions and our internal life are inevitably gendered, and director Pete Docter likely made these choices carefully. For instance, it seems that Disgust had to be part of the menu of emotions because a teenage girl needs a barometer of what’s cool or not, and Mindy Kaling’s character provided that. (You don’t just go and talk the popular girls, she wisely counsels. “You want them to like you.”) How much that applies outside of a preteen’s life or not is a subject for debate. We all might feel that way in various adult social situations, at a party or the workplace. 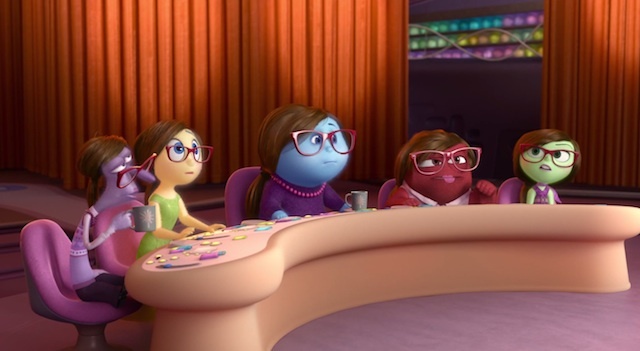 In short, Inside Out is an exhilarating look into the human mind, particularly of the preteen kind. It’s probably Pixar’s first truly successful film with a female protagonist, and it soars with ingenuity and empathy in portraying the inner life of an eleven-year-old girl. But you still find yourself wondering—what do the film’s creative choices tell us about the way we think about gender? Are moms really governed by Sadness, while dads are governed by Anger? It might have been a throwaway gag, but it says a lot. Are these really the five basic emotions in life—and how would we have responded if Disgust were male but Fear were female? The latter choice, in particular, might be interpreted as sexist, seeming to frame femininity as weak. There are other tantalizing questions as well. Why are all the people in mom’s mind female and dad’s mind male, while Riley gets a bit of both? Is it just because Riley is a preteen whose gender identity hasn’t been fully frozen in place? Will Anger or Fear pursue gender reassignment in the sequel? Are these serious questions? Who knows? Inside Out gives feints and clues toward resolution about gender and sexuality, but it never fully settles on answers—a situation many adolescents and tweens can probably understand. The film advances an oddly, reassuringly universalist message—everyone of us has the same cast of emotional characters in our minds—yet these take a variety of gendered forms. To quote another Tropics of Meta piece, the minds in Inside Out tell us “we’re all the same, except that we’re not.” In any case, I would be happy spending plenty of time in the minds of the people at Pixar. Next Austerity vs Democracy: What’s Happening in Greece? Though I did love the big red PUBERTY button. I’d like to see another red button with MENOPAUSE on it for us older women to snicker at. The question of the mixed genders of Riley’s emotions occurred to me as well. The best answer I can come up with is that they wanted to give big roles to Lewis Black and Bill Hader. Well Disney has done some blunders and has remained in controversy before. About Up, I think when we grow up our adventures change. The old man later sees her diary and it is all filled with great things of the household. He takes the adventure for her and house signifying her spirit is, in the end exactly where she drew it. Actually, The girl who worked at the pizza shop also had a mix of both girls and boys, while the “cool” girl that is likely the same age as Riley has an all-female cast. Maybe it has less to do with age and development but follows the idea that gender and sexuality are more like shades of grey than black & white. Each character actually has different “lead” emotions so not every woman was headed by sadness/man by anger- The teacher was headed by joy, pizza girl by disgust, cool girl by fear, clown by happiness, etc. Also Disgust exists outside of the teenage years- it keeps up from being poisoned physically (eating spoiled food, personal hygiene, etc.) and socially (manners, not spreading germs, etc.) It kind of covers all the safety issues that Fear wouldn’t necessarily cover. We also see different minds have female versions of Fear and Male versions of disgust.